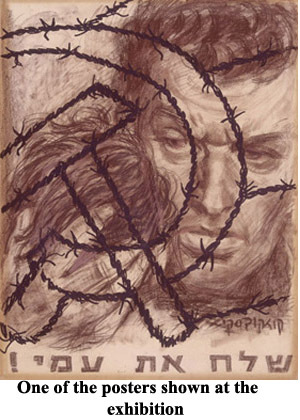 On September 30, the exhibition "Jews of Struggle: The Jewish National Movement in the USSR, 1967-1989" was unveiled in the Museum of Jewish Diaspora (http://www.bh.org.il) in the Campus of Tel-Aviv University. 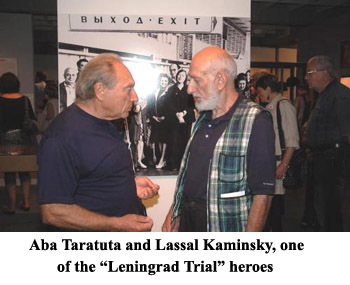 The exhibition commemorates 40 years of struggle by Jews from the former USSR for their right to repatriate to Israel. Even before it was opened, during the course of preparing and collecting documented evidence, this exhibition brought about disputes and disagreements. The exhibition also provoked disputes and conflicting opinions on its opening day which was, without doubt, moving, ceremonial and pleasing. I haven't met so many people whom I knew from the days of "refusal” since I left Russia. The exhibition makes a good visual impression, the museum designer has done a great job: the photos are perfectly aligned, the light doesn't blind the eyes, the red frames are of exactly the right color not to distract from the pictures and posters with texts are placed between the windows - just as it should be. But what can all this tell those who have never known the meaning of the word "refusal”? Will it explain how people who were "refused" managed to maintain their hope of getting a visa to Israel despite hardship and extended waiting, often for many years, or how the "refusnik" community was related to the dissident movement, to Hebrew lessons, to Jewish kindergartens, to "Ovrazhki", to trips from Moscow to Bukhara, from Kiev to Riga, to mail packages with books in Hebrew and tapes with Rav Carlebach singing Jewish songs? As envisioned by its organizers, the exhibition was supposed to convey all this to the visitors and especially to schoolchildren and their teachers as, during the last few years, the topic of the struggle of Soviet Jewry has been excluded from the school history syllabus. According to many historians, this led to gaps in the education of Israeli schoolchildren and to insufficient knowledge of their Jewish heritage. As to schoolteachers, not many of them are knowledgeable about this period in the life of Soviet Jews although it ended less than 20 years ago, It was only in 1989 that Gorbachev raised the "iron curtain" thereby giving a start to "Great Aliyah", the mass repatriation of Jews. Even during the course of its preparation, it was clear that the exhibition would arouse controversy and provoke dissenting opinions. The exhibition is largely based on materials furnished by the Association Remember and Save (http://www.soviet-jews-exodus.com), established by the famous refusenik from Leningrad, Aba Taratuta, who collected practically single-handedly an enormous archive of interesting, rare and invaluable documents to be found nowhere else. For almost one year, the curator Rachel Shnold and the designer Rachel Lev worked on the exposition dedicated to the Zionist movement in the USSR and to the struggle of Soviet Jews for repatriation during the years 1967 through 1989. But why exactly this time period? The movement for the right of repatriation to Israel began in the end of 1940's, didn't it? As explained by Nathan Sharansky, Chairman of the Board of Directors of the Museum of Jewish Diaspora, it is impossible to show everything in one exhibition, and the Six Day War gave a start to the sharp leap in the growth of national self-consciousness of the Soviet Jews. But let us never forget that even in the 1940's Soviet Jews were sent to incarceration in the GULAG for their Jewish identity, Zionist activities and desire to repatriate to Israel. There is no doubt that the exhibition attracts those who were a part of the "refusenik” movement; those who understood what was going from the inside. It is not for nothing that during the opening evening, some of the guests abandoned the refreshments and friends and went strolling along the walls of the exhibition hall. With a feeling of delighted nostalgia they recognized themselves in heavily magnified and therefore slightly blurry (or maybe the sharpness has been washed away by time and forgetfulness?) old black-and-white pictures, still as children in the company of their refusenik parents in the beginning of the 1970's or already grown-up in the 1980's. Some were curious, some excited. I just felt uncomfortable. I was suddenly overwhelmed by the memories of a cold Moscow of the middle of the 1980's, distressing visits of arrogantly polite KGB agents, the question of the 3 year old daughter "Mummy, why is this uncle always sitting on the swing in our backyard? ", memories of police searches, surveillance, disconnected telephones, of strangely behaved neighbors who suddenly stopped saying hello, memories of demonstrations and fights. I didn't want these memories to come back, but documents, pictures, amateur movies ("It is my dad who filmed this!" exclaims my friend who came here as a child back in 1973 and whom I met at the opening ceremony) reminded me of all this. 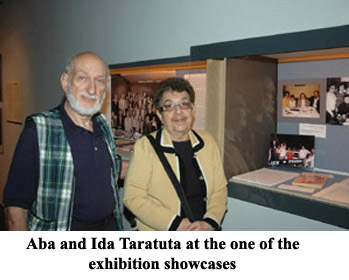 However, the exhibition is intended not for the several hundreds or thousands of the "refusenik" movement activists, not for the former Hebrew teachers, not for those for whom Zionism became the meaning of life; it is addressed to those who did not know and still know nothing about this period. Will they be able to learn more? Not unless they will really want to. The exhibition is visually beautiful but not impressive enough. Old pictures only appeal to family members but not to occasional visitors. Some texts are not translated into Russian. The exposition is too official and incomprehensive. Could that be due to haste or to the desire to restrain the scope of the subject? Anyway, by design, the exhibition is intended for those who know nothing and have never heard of even the mere existence of the refusenik movement in Russia, Ukraine, Moldova, in the Asian and Baltic republics. And they will not learn much of this unless they buy the catalog and read it for a few days successively, scrutinizing the same pictures not in the stream of visitors but sitting at home. The fact that the exhibition is based on a single archive with a few additional documents caused some disappointment in those who believed that the role of certain people and organizations in the struggle for repatriation was insufficiently featured. Lena Stern, Yuri Stern's widow, talked about this during the opening ceremony. She pointed out that the exhibition did not mention the contribution of the Information Center in the struggle for the repatriation of Soviet Jews. This Information Center was established by five former aliya activists, including Yuri Stern (whose memorial site is www.yurishtern.org.il), in Jerusalem in 1985 and later (in 1988) became the Zionist Forum chaired by Nathan Sharansky. On the other hand, Yuly Edelstein was sincerely pleased by the exhibition and gave a short speech on society and politics, addressing only a small number of listeners, among them Ira Dashevsky, one of the founders of the "Mahanaim" movement in the middle of 1980's in Moscow (http://www.machanaim.org). Only one (!) short sentence was dedicated to this movement that attracted thousands of Jews - both in Moscow and in Jerusalem – to the values of Judaism. It hurts, it is not enough – but it was clear from the beginning that it is impossible to cover everything and that not everyone will be satisfied. It is pleasing, however, that the organizers of the exhibition did not forget to mention the "Purimshpils", Jewish kindergartens, scientific seminars of refusniks and Hebrew teachers. There was much controversy around the exposition – and this is good. This means that, despite all the drawbacks mentioned above and despite its official character, the exhibition touched many people and aroused much interest – otherwise there would be nothing to dispute. Photo-albums from those years, drawings, movie clips, correspondence, examples of the famous "samisdat" literature, all this evidence of that era, collected by the museum specialists and assistants, have now become known not only to the eyewitnesses of the 40-years-old events, but is now accessible to the visitors of the exhibition. 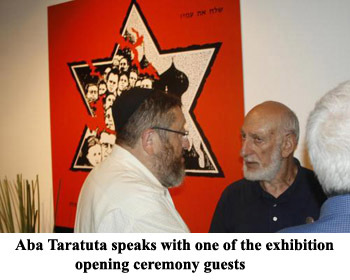 The exhibition "Jews of Struggle, 1967-1989" in Beit-Ha-Tfutzot will last till May 30, 2008. It will then move to New York and Canada – Jews there also have memories of those days.